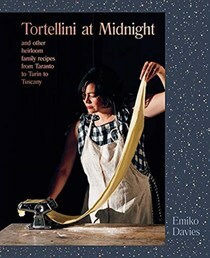 We are pleased to share a promotion for our next EYBD Book, Tortellini at Midnight: and Other Heirloom Family Recipes from Taranto to Turin to Tuscany by Emiko Davies. Emiko's writing has held me in its seductive grip since I reviewed her first book, Florentine. I found serenity in her words and recipes. Her second title, Acquacotta (a celebration of the traditional cuisine of a lesser known part of Tuscany, the Silver Coast) was equally as brilliant. I would think that one would not be able to continue to create such beauty time and again, but I would be wrong. Emiko's latest is perfection with vivid storytelling, stellar photographs and recipes that will inspire and lure us into the kitchen. The first recipe that I made from the book was the Pasta con la ricotta (photo above) a dish that took the time needed to cook the pasta, but resulted in a delicious and comforting meal. From the title, to the paper the book is captured upon, to its glorious content, Tortellini at Midnight is magic. Emiko is touring, check our calendar to see if she is in your area. Please note that you must be logged into the Rafflecopter contest before posting or your entry won't be counted. For more information on this process, please see our step-by-step help post. Be sure to check your spam filters to receive our email notifications. Prizes can take up to 6 weeks to arrive from the publishers. If you are not already a Member, you can join at no cost. The contest ends at midnight on May 7th, 2019. Stuffed mussels will probably be a first recipe for our house. Baked Ziti, Baked Ziti and more Baked Ziti! Nonna Annas Meatballs for sure. We eat spaghetti a lot and a new spin on meatballs from what we usually have would be excellent. Who can choose - so much deliciousness! Nonna Anna's meatballs would be my first! Pasta with ricotta - it sounds so delicate! The hand-pulled walnut grissini look particularly delicious!